4x12 Wicker Polished Brass Floor Register Discounts Apply ! 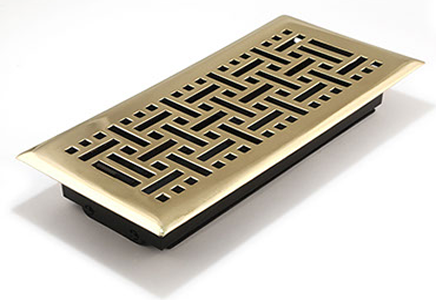 Your new brass vent cover has a beautiful polished brass finish. These 4 x 12 metal register covers are brass plated over a steel core for added stability. 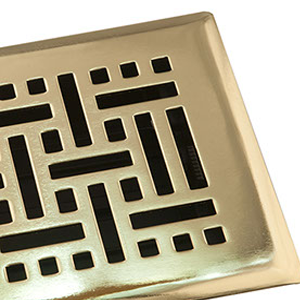 Brass vent covers have a tarnish resistant finish to prevent corrosion. Metal register covers have an adjustable damper for air flow control. Polished brass vent covers are a staple in many homes and the wicker pattern gives these metal register covers a fresh look. ***Hint: The industry standard is to order metal register covers using the actual hole opening size and not the faceplate size. This brass vent cover will fit a 4 x 12 inch hole opening. When ordering metal register covers you can choose from 10 different sizes and 4 metal plated finishes. These brass vent covers are an updated look on a classic register. Place your order today!